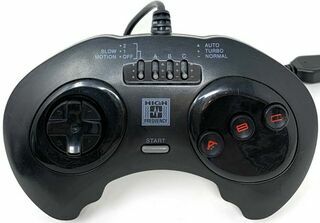 The Mad Catz 3 Button Controller is a third-party controller for the Sega Mega Drive developed by Mad Catz. It is, as the name suggests, a three button controller with added turbo features, but is otherwise mostly unremarkable. There are a few slight variations of this controller. Mad Catz changed their logo during the production run meaning some have slightly different labels (on top of the common High Frequency label which Mad Catz also used when selling to Toys R Us). In Europe it was distributed by Gamester as the MD-3. It would be followed by the Mad Catz 6 Button Controller.